The Jade Lakes Trail is one of the premier hikes in Mount Revelstoke National Park near Revelstoke BC, and being that we were spending a weekend camping with our family at nearby Martha Creek Provincial Park, we chose a nice and sunny summer day in August as the day to tackle this trail. We didn’t have a firm plan on whether we would get to all the lakes or not but figured we’d just see how far along the trail we could go. We got an early start as it is quite a drive up the road to the summit. 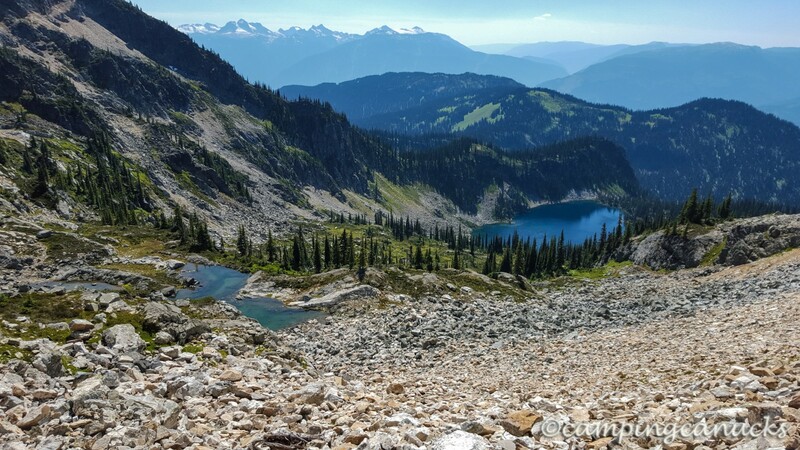 One of the nice things about this hike is that you can drive to the top of Mount Revelstoke and start from there, which saves a lot in the way of elevation gain. And starting early is a good idea to avoid the inevitable slow RV’s and buses that choke the road in the summer. Don’t start too early, though, as the park gate doesn’t open until 8am. Before 8am, you have to walk or bike to the top. 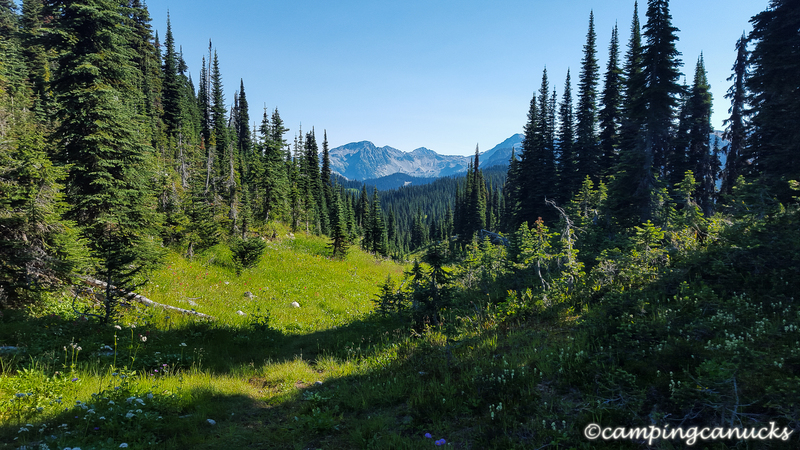 Once we were parked, we quickly hiked the kilometer to where the trailhead started and made our way towards the lakes along a well maintained and easy to follow trail. 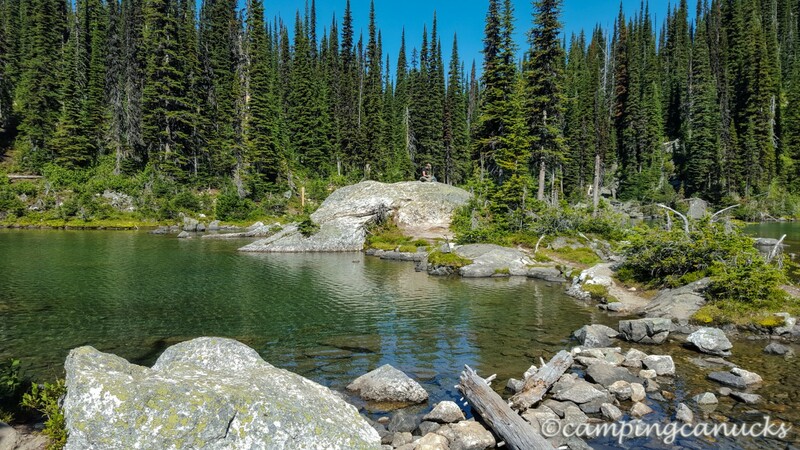 It’s a bit over six kilometers to Miller Lake, with much of it winding through the meadows, over slides, and around cliffs. Here and there the sounds of pikas and marmots could be heard near the slides and talus slopes. At one point, we came across a marmot that sat still for so long, we thought it was dead – until it gave a startled squeak and ran for cover. Overall there wasn’t much elevation gain on this part of the trail until we got closer to Miller Lake, where the trail takes a bit of a higher climb before reaching the junction for Miller and Eva Lakes. Miller Lake is stunning. It’s approached through the trees so there is no real view of the lake until you almost reach it. The lake is nestled in a bowl surrounded by meadows, forest, and rocks and has the characteristic clear colours of an alpine lake. On a hot summer day, it was almost an invitation to strip down and jump in. We stopped at the lake for a bit of a break and just enjoyed the scene. Our timing was good as we left just as other groups were arriving, although we did not find that the trail was crowded during this hike. 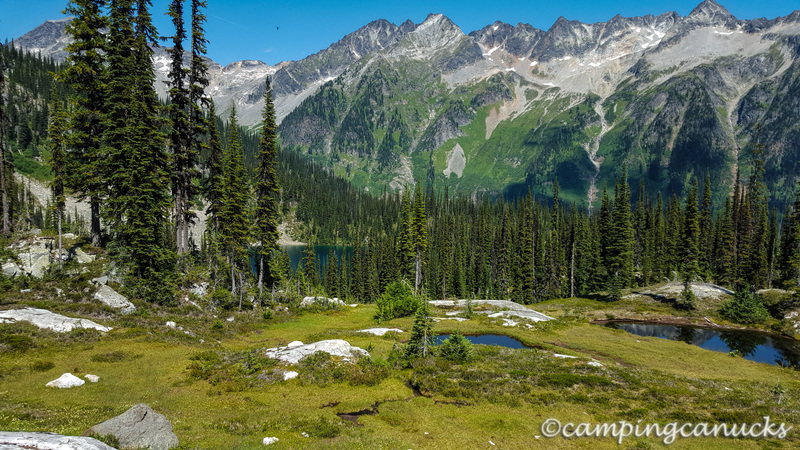 Once we were finished at Miller Lake, we hiked back the way we came and onto the trail over to Eva Lake. This was a bit of a longer stretch but it wasn’t too long before we found ourselves at the second of the lakes along this route. Eva Lake was also quite stunning with its backdrop of peaks and vivid blue skies. We didn’t really linger here due to the horseflies but walked around a bit by the cabin near the lake and took some photos. From Eva, we hiked back to the junction and decided to carry on with hiking up to Jade Pass. This part of the trail became a bit steeper as we wound our way up above the treeline. It was also quite a bit hotter as the temperature jumped over 30 degrees by this point in the day. As we made our way higher towards the pass, we could begin to see the many ranges of mountains that surround this area. And for an August day, it was remarkably clear with very little smoke in the sky. 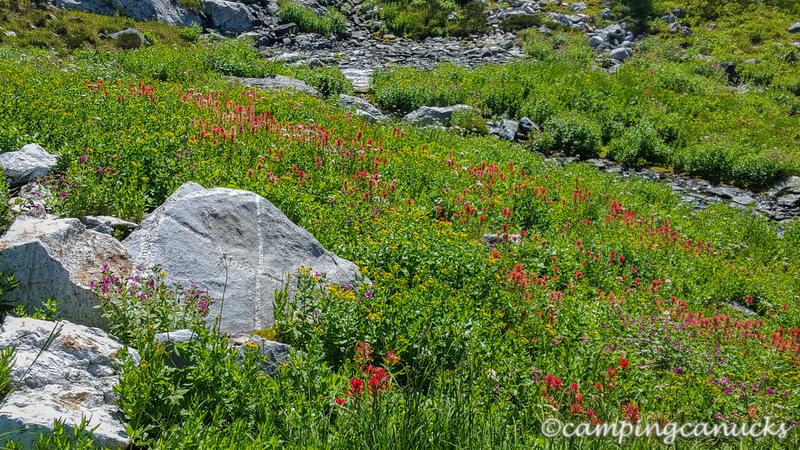 The meadows were also in full bloom and contributed their many colours to this wonderful mountain vista. 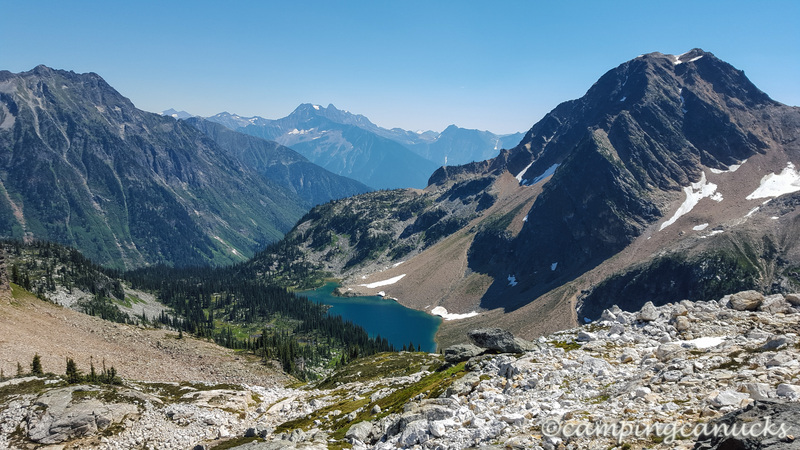 It got a bit steeper and rougher in the rocks near the top of the pass but once up there, we could see the view to the east and Upper Jade Lake. The wow factor of standing in the mountains and drinking in a scene like this was as awesome as we had expected it to be. Being that we had come this far, we figured we might as well continue on down to the lake and fully complete the hike in its entirety. The way down was rocky and rough but it didn’t take long before we stood on the eastern shore of Upper Jade Lake and could look back up at Jade Pass from where we had come down. It did look a little daunting on a hot day like this thinking about the trip back up to the pass. There were some people camping at the site on the lake and as we didn’t have our water filter along, they were kind enough to let us use their filter to refill our water. A good thing with a hot climb ahead. Afterwards we wandered around and appreciated one of the finest views we’ve seen from an outhouse of some ponds and another of the Jade Lakes. It was starting to get a bit late at this point in the day, so we didn’t linger too long and began making our way back to the top. It was a very hot hike back up as there was no shade to be found. Luckily there was still snow here and there so we were using that to cool off. 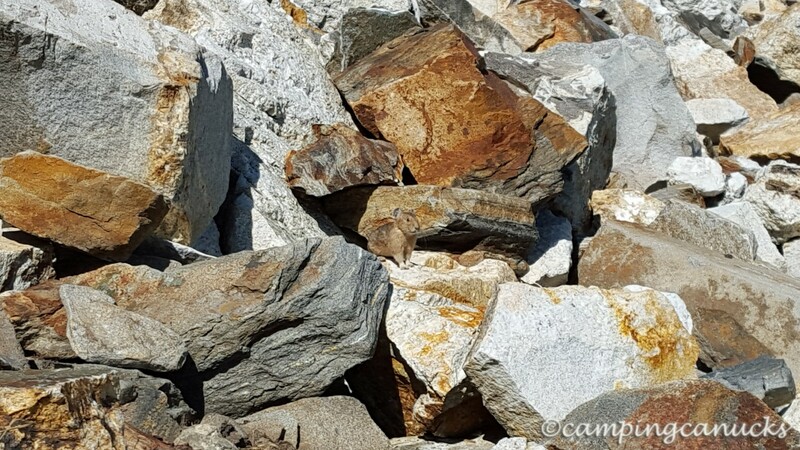 The pikas seemed to like the heat, though, as we saw and heard several in the rocks along the way. We can’t pretend that we like hiking in high temperatures but eventually we reached the pass and began making our way back down towards the trailhead. There were more people on the trail at this point and we didn’t envy them making their way up the western side of the pass in the blazing sun. Several people did look like they were going to collapse from the heat. At this point, it was largely downhill and it was only a couple of hours later when we arrived back at our truck and ended our hike. All said, we were on the trail for about eight hours, covered over 24 kilometers and managed to get to all three of the lakes. 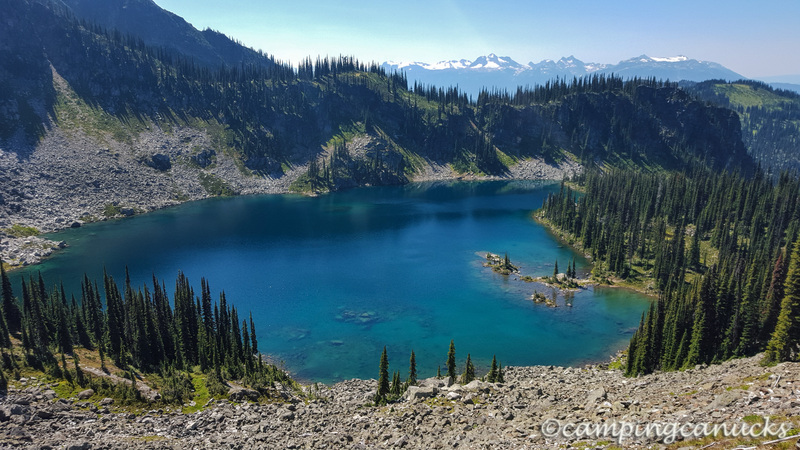 This was a great hike and we would certainly recommend it to anyone with a day to burn hiking near Revelstoke. 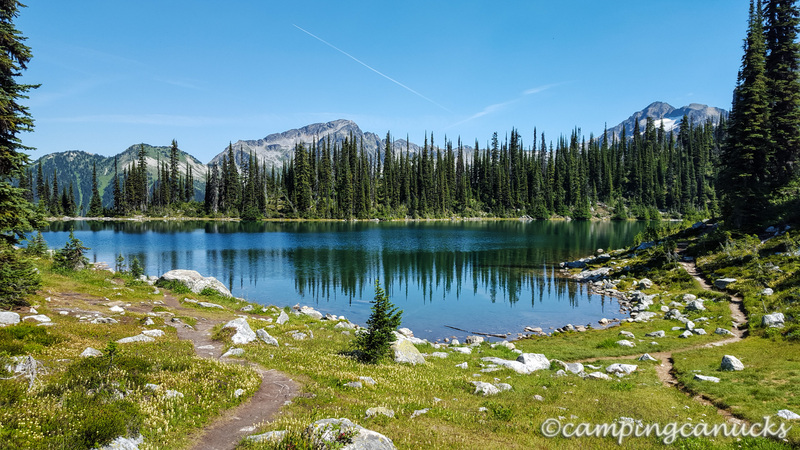 We also think that a backpack for a couple of nights at Upper Jade Lake would be a worthy trip as well, as there were many scrambling opportunities in the area, particularly at the top of Jade Pass and by Upper Jade Lake. We expect there would be some great views to be had from the top of several peaks in the park as well as some additional trails to explore for those with the time to make it happen. I am one of the founders of campingcanucks.com. I was lucky enough to grow up in Golden, British Columbia and have been camping, backpacking, and skiing pretty well all my life. I also started climbing a couple of years ago which has opened up even more backcountry opportunities. These days, I'm a systems administrator by trade and look forward to spending as much time as I can in the outdoors. Jeremy, Thanks for this post and the beautiful pictures. 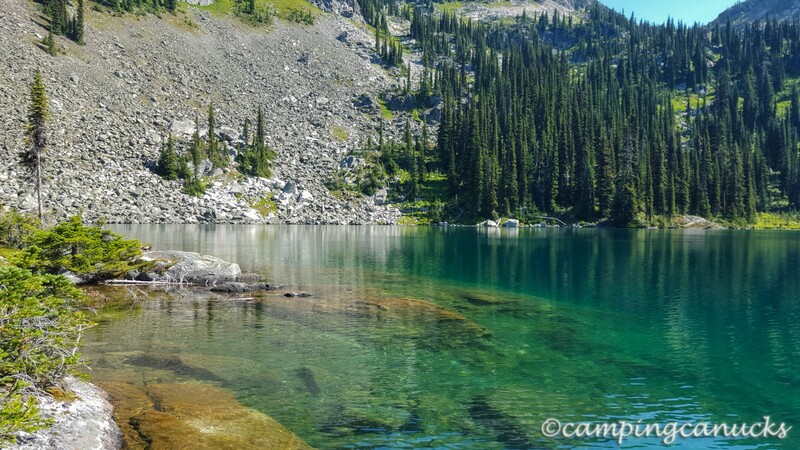 It brings back my memories of camping beside Upper Jade Lake for two weeks in the late 1960s. This is still the magnificent place I remember it to be. Thank you, Rich! It most definitely is a magnificent place. 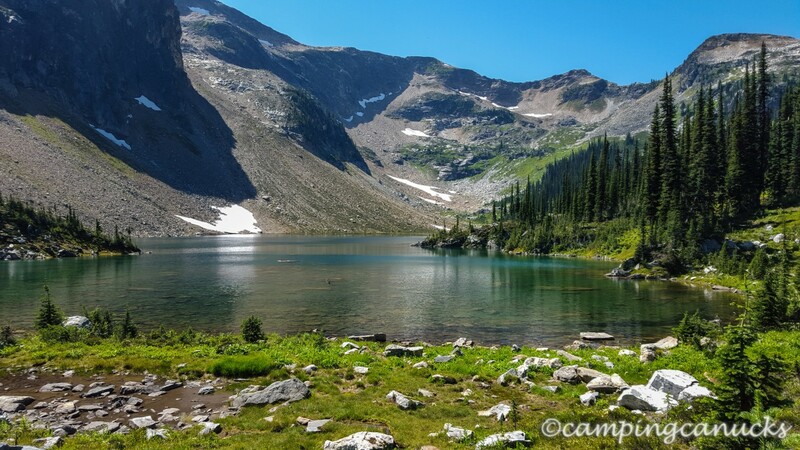 We intend to go and spend a few nights at Upper Jade Lake at some point to explore the area a bit. Can you hike this in the winter? Thanks, Jeremy. I will check it out. Do you know how to reserve a campsite at Upper Jade Lakes? Or is it first come first serve? Camping Canucks © 2019. All Rights Reserved.